Yes indeed,Spring has finally arrived up here in the back of the beyond of Ferry County, Washington! Good thing too, as it is almost time for Summer. And by “Spring” I mean the absence of snow and not necessarily the arrival of such things as Tulips, Daffodils and Flowering Fruit Trees because that hasn’t happened yet. Maybe next week? But yesterday we had the warmest day so far this year when the temperature, for a brief moment or two, hit 70°. Let me tell you, it was a glorious moment that I celebrated by donning a cute pair of sandals to show off my new pedicure! Go ahead and laugh but it truly takes very little to make me happy and having my toesies out for the first time in months had me almost deliriously happy! We still have a lot of indoor work to do before our new house is complete but Sparky and I could not bear being indoors the past couple of days with all the sunshine and mild weather so we looked for excuses to be outside. Sparky hauled his boat out of the garage and have it a good cleaning. I puttered and putzed in the garden and the yard. We made mental notes of what needed to be done in both the garden and the yard and believe me, there is a lot to do getting both areas to where we want them to be. Here’s how things are shaping up right now. The return of the Goldfinch is something I eagerly await every Spring. And here they are! 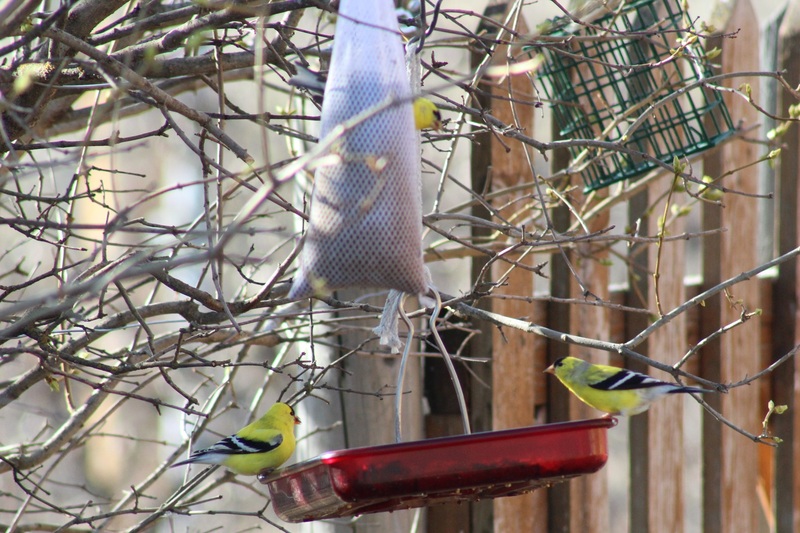 I have 2 Thistle feeders hanging plus a tray feeder that the bright yellow and black finches love. 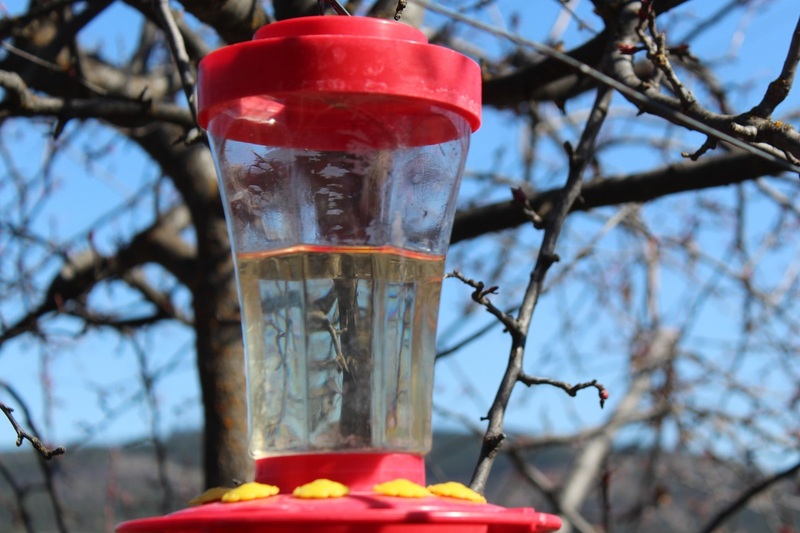 Several of our neighbors report that the male Rufus Hummingbirds have returned. We are not so lucky but I am ready and 2 feeders are full of sugar water. 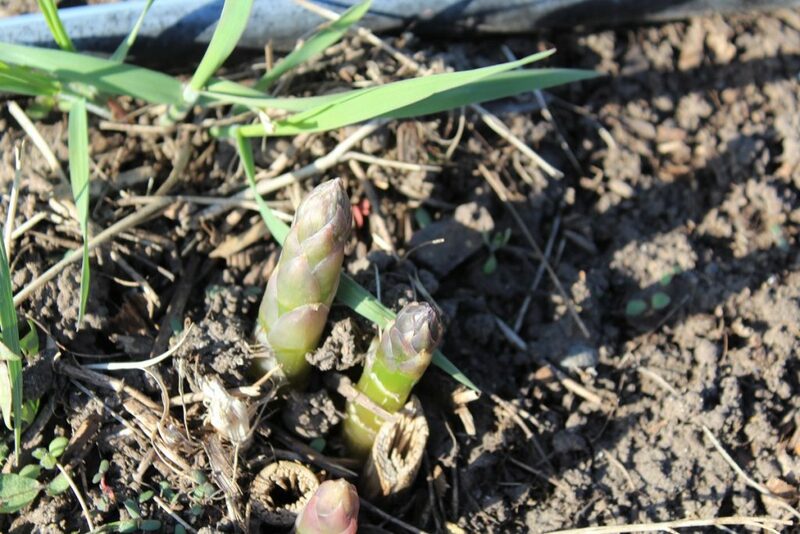 In the garden department, Sparky’s prized asparagus are poking their heads up through the soil. 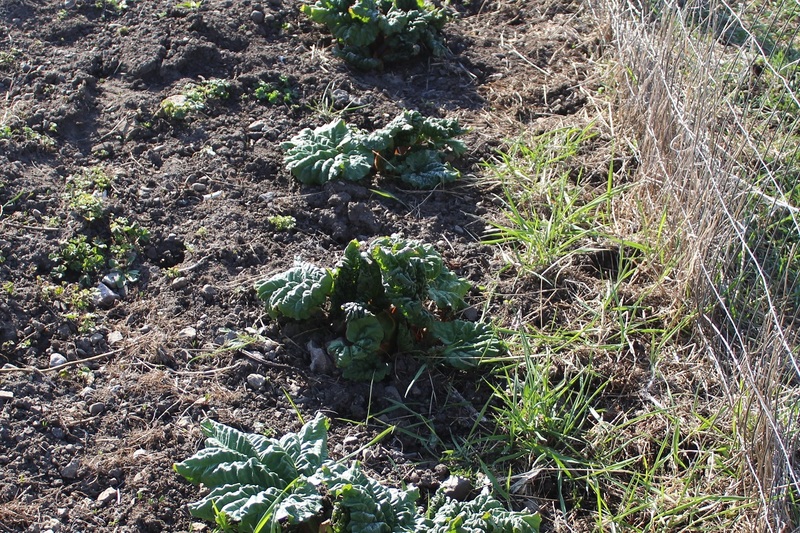 We are looking forward to many delightful meals featuring this early Spring vegetable. 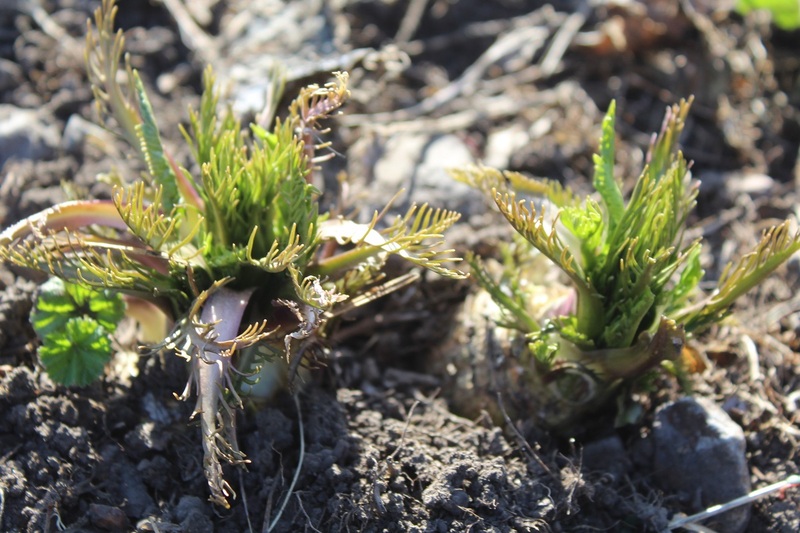 The perennial Horseradish Roots wintered over nicely and we hope to have a bumper crop this Fall. There is nothing quite like freshly grated Horseradish to clear your sinuses! Rhubarb Pie anyone? Strawberry Rhubarb Pie. Rhubarb Custard Pie. Upside down Rhubarb Cake. Can’t wait! The roots our neighbor gave us last year are up and happy. We lost our patch when we lived in Germany and Mike generously donated these to get us going again. This old Pear Tree has provided us and our neighbors with bushels of Bartlett Pears over the years. Looks like this year will not be any different. 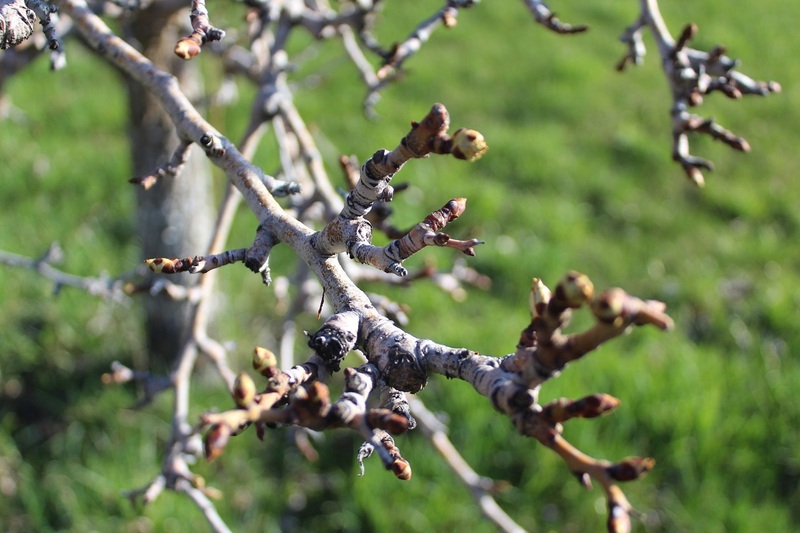 Buds are ready to pop! I am grateful to see my little Herb Garden survived as well as it did. 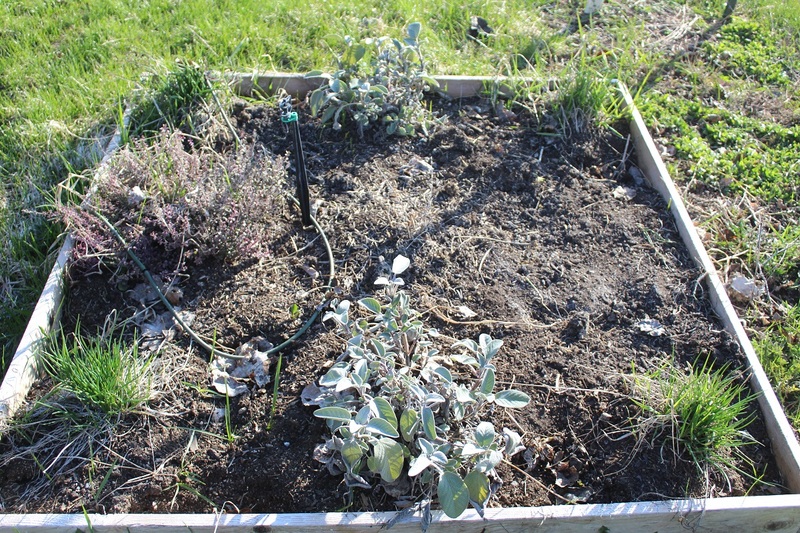 The Chives, Thyme and Sage all returned quite nicely. Unfortunately, my Rosemary plant did not make it through our incredibly harsh winter. But, it will be replaced and the Herb Garden extended as I love cooking with fresh Herbs! We have several Basil plants started and hope for a bumper crop this year. 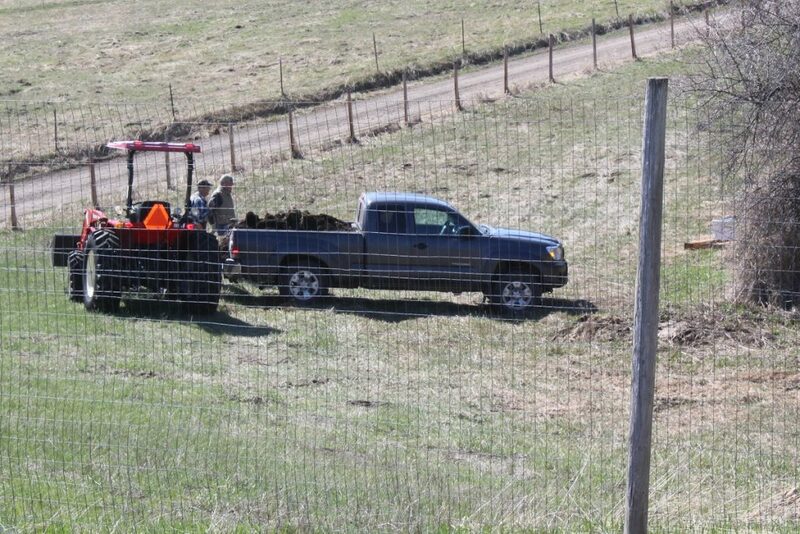 Our neighbor Mike came down for a truck load of composted Alpaca poop. Nothing better to use a fertilizer than Alpaca beans! And this pile has composted for several years making it perfect for the garden. Mike and Dan happily shooting the breeze and talking planting. The hillsides are covered with these tiny first harbingers of Spring. 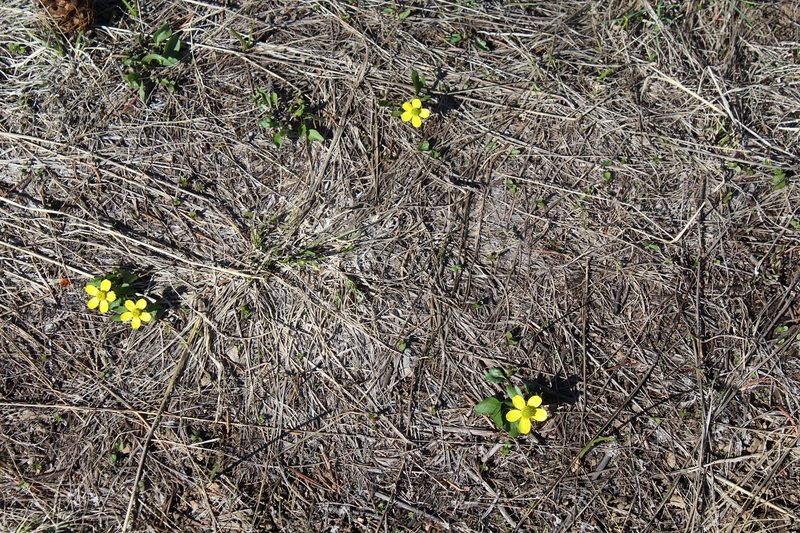 You have to look close to find them but these cheery little Buttercups are everywhere! 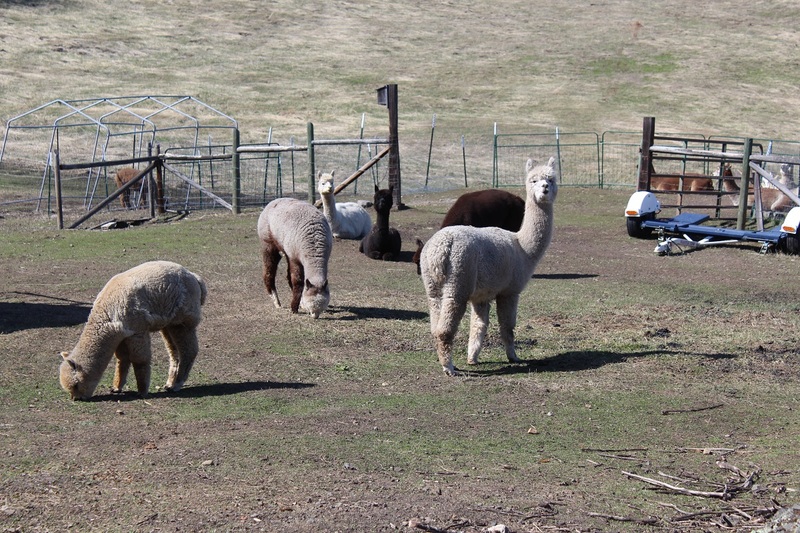 No one is enjoying Spring more than our Alpacas! The snow is gone. The knee high flooded pastures are gone and tiny green grass shoots are making all of them very happy! 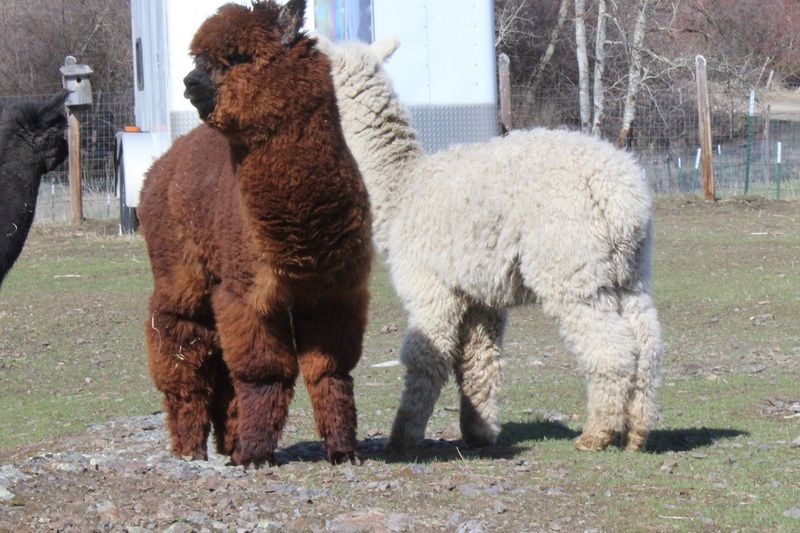 Last years crias are gorgeous in full fleece and they love scampering about the pastures enjoying the mild weather. We love just standing around watching them play! The little white one is Autumn Equinox who was a late September birth. I was so worried about him being able to thrive or even survive this horrible winter but he did fantastic! His mother really stepped up to the plate to care for him and the others all huddled to keep him warm. His mother has lost a bit of weight keeping him nourished but she is healthy and the weight will return. Sparky and I have spent a fair amount of time hiking the back 40 wearing hiking boots and not snow shoes! 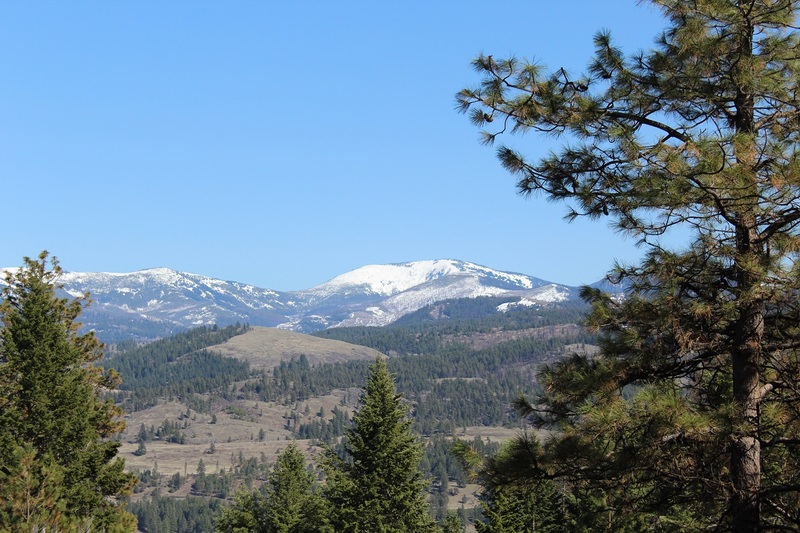 The views from the hill tops are just stunning as the distant mountains “green up” but are still wearing their snow caps. It will be June before all that snow is gone. And this is how Spring comes to the back of the beyond of Ferry County, Washington. Slow. Very slow, but that makes us appreciate it even more. Thanks for stopping by today! I enjoy sharing our world with you all. It truly is a special place to live and grow. Our own little piece of paradise. Today, Sparky and I are hauling that boat down to the lake and hope to come home with our limit of Trout. It’s called ” playing hooky” or ” maybe it is time for us to practice being retired,” inside of non stop working. I’ll keep you posted on our catch. Stop by my website and leave me a comment: www.thejourneygirl.com. I love hearing from you all! Love the pictures…I love your writing…if you didn’t post pictures I would still be able to picture what you are talking about because you describe everything with such detail. Love the pictures of the Alpacas. So precious. Weather has improved here. We hit 70 degrees two days in a row but now back to rain and grey skies and cooler temps. Supposedly next week back up into the high 60’s and low 70’s with sunshine. Can’t thank you enough for your love and support! Hi Karen! I have been reading your bog for a little while now, and just wanted to say thank you! I am a mother of four hoping to relocate to your area. If we are fortunate enough to be neighbors, we would love to meet you! Thanks again for sharing your little slice of heaven and inspiring us to do the same.